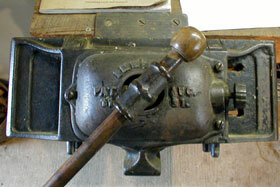 This is my website on the Emmert Patternmaker's Vise and other similar vises. Don't tell anyone but I think I've turned into a vise-aholic. his head and his heart is an artist. Folder Password Expert - Security software to protect folders in Windows XP, 2000, NT, 98, ME. Password Generator - Software to generate random passwords in Windows XP, 2000, NT, 98, ME. As methods of designing and producing construction drawings change, certain challenges emerge. 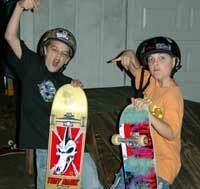 Among these challenges is understanding the existing knowledge base. Building Information Modeling (BIM) is an innovative approach to building design, construction, and management that is completely altering the way the industry operates. This dramatic change is reminiscent of when paper drafting was replaced by computer aided drafting, improving project coordination and decreasing the cost of revisions. BIM furthers the collaborative process among and between architects, engineers and contractors, and when the tool is used by the contracting community, it can lead to better cost estimating, coordinated work processes and significant reductions in schedule. The term Building Information Modeling was coined by Autodesk in 2002. 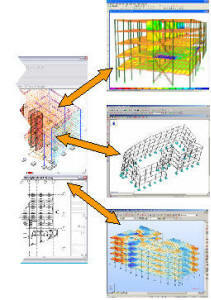 Other terms such as Parametric Modeling, Virtual Building Environment and BuildingSMART describe the same concept. The notion is to create an internally consistent, virtual building made of intelligent objects instead of drawing lines, arcs, and circles that represent walls, doors and other building components. BIM integrates information from all aspects of the building process and dramatically increases the availability of that information. This information can encompass the life cycle of the design process of a given building including as-constructed and as-operated data. The benefits enabled by BIM are significantly changing the way buildings are designed, fabricated and operated. Integrated project delivery brings together all the players in the lifecycle of a building to create, manage and share information about design and construction, from concept to reuse or demolition, as a team. Ideally, the building design team uses the same BIM platform, thus ensuring the seamless flow of information and collaboration. The reality is that many consultants and architectural, engineering and construction (AEC) firms that use BIM applications often use different programs, making collaboration difficult at best. At PageSoutherlandPage, which has in-house mechanical, electrical and plumbing (MEP) engineering, coordination issues are virtually nonexistent. BIM is a design, delivery and management approach that provides continuous, immediate access to reliable geometry, schedules and cost information. Architects, engineers, contractors, owners and facility managers immediately benefit from the 3D visualization collision detection options which prevent building system components from being designed in proximities that could interfere with each other. Because BIM is a fully integrated digital representation of the project, it becomes a key decision making tool to effectively explore changes and options. All parties benefit from the consistent, coordinated and higher quality documentation and specifications that exist within the BIM model for construction information. For the contractor, the BIM model can be used effectively to create ordering, fabrication, and delivery schedules for all building materials and systems. It can also graphically represent construction sequencing. Third party products can also be utilized to provide costing data to provide faster, more accurate cost estimates. Shop drawings for sheet metal ductwork, for example, are generated directly from the BIM model, as can be the steel detailer. Building owners and facility managers have the opportunity to use the BIM model and intelligent information for renovations, space planning, maintenance, asset tracking and much more. The BIM model can also be used to graphically illustrate potential security issues, signage, evacuation plans and building analysis. PageSoutherlandPage has been a pioneer in BIM application and development. Recognizing the value of BIM as early as 2000, PageSoutherlandPage was one of the first architectural and engineering firms in the United States to pilot the Architectural Desktop (ADT) application. Since deploying ADT on a firm-wide basis as a productivity tool for construction documents, PageSoutherlandPage has used ADT BIM capabilities for the design of facilities throughout the country. 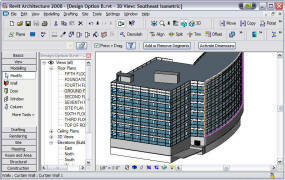 Revit has quickly become the leading design and construction industry’s leading BIM application. Revit is a parametric modeling program that is an adjustable design tool based on equations, statistics and mathematics. Revit was the first parametric building modeler developed for the design and construction industry offering unprecedented ease of use and intuitive design capabilities. Revit has had several name changes over the past few years, from the original Revit Building to the current Revit Architecture. Revit Systems, the mechanical, electrical, and plumbing portion of Revit, is now known as Revit MEP. Using the best tools to increase productivity and collaboration helps PageSoutherlandPage retain its edge in the marketplace. Today, Autodesk AutoCAD MEP provides greater support and design capabilities to building engineering applications than does Revit MEP. 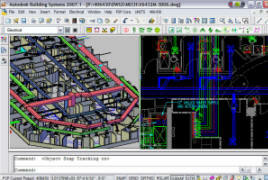 AutoCAD MEP, formally Architectural Building Systems, is the companion product to AutoCAD Architecture. It provides full 3D object-based design and is considered a BIM product. Revit MEP is quickly being developed, but at this time it is still immature as a production tool. The engineering team at PageSoutherlandPage currently uses AutoCAD MEP for its MEP engineering services. To address the transition to BIM, PageSoutherlandPage has developed a Technology Transition Plan which includes understanding and defining goals, identifying the pertinent facts, creating concepts, developing action plans, and optimizing the technology for prolonged success. To facilitate its adoption, PageSoutherlandPage employs in its Houston office a full-time “BIM Advocate.” The BIM advocate trains and works with BIM project teams to ensure they are fully BIM qualified and are utilizing the best BIM practices. As the BIM tools mature, PageSoutherlandPage will continue to explore, test, maintain and embrace this new technology in the AEC industry. Carl Matthews, AIA, is one the few licensed architects in the country who, after many years as a practicing architect, has spent a decade as a Director of Information Technology for an architecture firm. Additionally, Carl has provided consulting IT services for a number of organizations, including Microsoft, and is a member of a special committee, National BIM Standard Project Committee, which was created by Facility Information Council in 2005 to create a BIM standard for the AEC industry.